Gastritis is a disease characterized by irritation and inflammation of mucosa or stomach lining. Our stomach lining secretes certain enzymes, acids that aid digestion. It also secretes mucus that saves the stomach lining from the corrosive action of acid. Inflammation of stomach lining or gastritis lowers the production of digestive enzymes and acids jeopardizing the process of digestion. 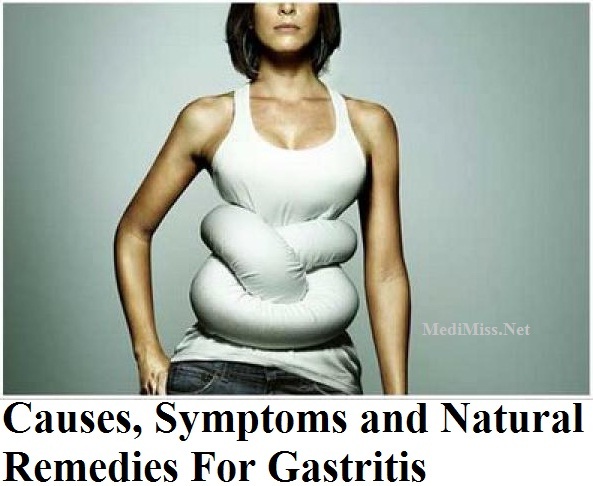 Acute gastritis is caused due to sudden and severe inflammation of the stomach lining. If gastritis continues for a prolonged period, it becomes chronic in nature. Erosive gastritis is a type that results in loss of stomach lining due to erosion or wearing out. Erosive gastritis may be acute or chronic, and may result in severe ulcer formation. Erosive gastritis caused due to some surgery, illness or injury is also known as stress gastritis. 2. Other bacterial, fungal, parasitic or viral infection. 3. Prolonged intake of non steroidal anti-inflammatory drugs. 9. Potassium supplements and iron tablets. 15. Autoimmune disorder invading healthy cells of stomach lining. 16. Diseases like Crohn's disease, pernicious anemia. 14. Passing black, tarry stool. 1. Consuming two plantains early morning and then drinking a glass of milk after 30 minutes should be practiced every day to get rid of gastritis. 2. A glass of orange juice with some roasted cumin seeds and a pinch of rock salt added in to it is a quick natural relief from gastritis. 4. Drinking a glass of milk every night before going to bed helps one to deal effectively with gastritis. 5. Four crushed cloves of garlic may be consumed every morning in empty stomach. This is an effective gastritis remedy. 6. If one takes a heavy meal, to eliminate the possibility of gastritis, one may take a glass of water mixed with 2 teaspoon apple cider vinegar and one teaspoon honey. 7. Sucking a piece of jaggery after meals is a cure for gastritis. 8. Fennel seeds may be boiled in water, strained and sweetened with honey and then drunk frequently to tackle gastritis. 9. Two teaspoon of white vinegar may be taken after every meal to control gastritis. 10. Drinking ginger tea or spearmint tea frequently is a good natural remedy for gastritis. 11. Drinking a glass of water by adding powdered, roasted cumin seeds in to it is a gastritis cure. 12. Coconut water should be drunk frequently to check gastritis. 13. Cabbage based diet is good for gastritis patients. It ensures passing of clear motion and expulsion of gas from body. 14. Taking two or three big gulps of curd mixed rice can minimize gastritis symptoms. 15. Avoid heavy meals, take fiber rich diet, food rich in flavonoids and antioxidants should be consumed. 16. Refined food items are to be avoided and healthy cooking oil like olive oil should be used while cooking.